With all of our brilliant artist’s and our home designs available for printing on high-quality, melamine let us talk you through what we do. Here at Melamaster, we have been printing designs photographs and art on our high-quality, super resilient melamine products for over 40 years. We have a huge range consisting of melamine from dinner trays to mugs and everything in between. We have a variety of different designs from a great community of artists dedicated to creating stunning artwork designed homeware for you. Melamaster’s melamine printing is high quality and finished to the highest standard. Bespoke Melamine printing is 100% the best way to guarantee your loved ones love their gifts. 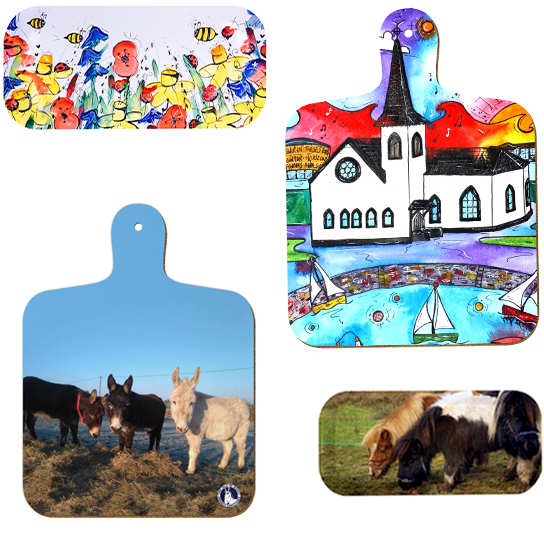 You can get your designs, logos and photos printed on a variety of different products like out brilliant melamine dinner trays or melamine chopping boards. For more information get in touch with us through our website or call us on 02476 724 900. We love absolutely every one of our artists, but sometimes you have an idea in your head that you cant find by a professional. Whether you are looking for a certain design that reminds you of your old childhood wallpaper or you are trying to start your art career and need a little boost with your own product range you can do that with us here. We offer a brilliant bespoke melamine printing service where you can have your own designs printed on a wide variety of products. If you are looking at getting a photo of the family printed on a chopping board (we won’t ask why) or if you are looking for the perfect way to say congratulations with a dinner tray, you can even choose the font. All you have to do is send us here at Melamaster ‘The Home Of Melamine UK‘ your design, photo or logo and you will receive a sample product in the post and once you have okayed the print, your order will be dispatched shortly after. And with worldwide delivery, no matter where you are you will receive the best quality around the globe. It really is that simple when you are working with the UK’s best melamine printers. We have a huge range of artist’s professional designs, so make sure you have a good look around our online store to see if anything takes your fancy. If you have any questions we will be more than happy to answer any, Just get in touch through our email sales@melamatser.co.uk or call us on 02476 724 900. We can’t wait to hear from you.